RALEIGH, NORTH CAROLINA - The Carolina Hurricanes waited 10 long years to finally bring the playoffs back to town. They almost seemed determined to cram a decade’s worth of goals and hits into one game. The result: Carolina’s most lopsided postseason victory since a 5-0 win over Edmonton in Game 2 of the 2006 Stanley Cup final. “Absolutely electric,” captain Justin Williams said. Washington won all four regular-season meetings with its longtime division rival — first in the old Southeast, now in the Metropolitan — before winning the first two games of this series on home ice. 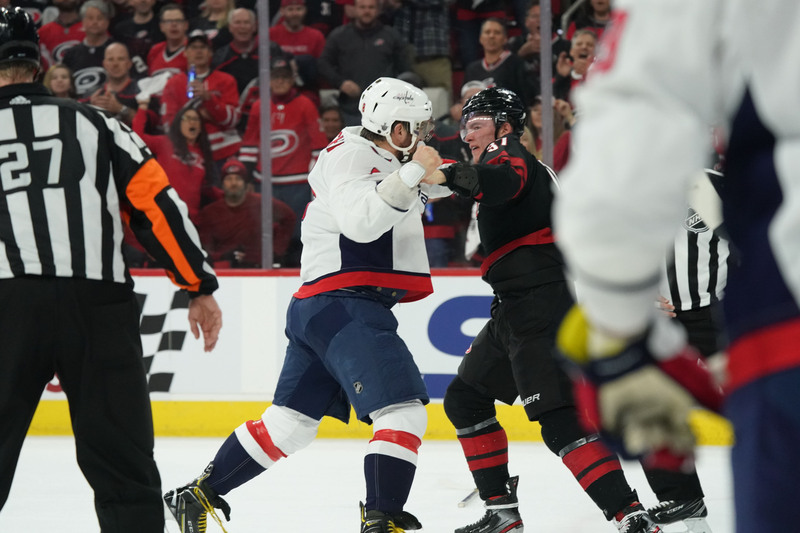 The first postseason game in Raleigh since 2009 — when Carolina was swept by Pittsburgh in the Eastern Conference final — was a physical, borderline violent affair, headlined by Ovechkin’s first career playoff fight, one that sent Hurricanes rookie Andrei Svechnikov’s head crashing onto the ice and knocked him out of the game. Carolina coach Rod Brind’Amour said he didn’t have an update on his 19-year-old forward. In Toronto, Auston Matthews scored his first goal of the playoffs and set up another as the hosts beat Boston to take a 2-1 lead in their Eastern Conference quarterfinal. In Denver, Nathan MacKinnon scored twice in the first period and set up newly signed rookie Cale Makar’s first NHL goal in his debut as Colorado routed Calgary to take a 2-1 lead in their first-round playoff series. It didn’t take long for him to make a big impact. He scored on his first NHL shot as his parents celebrated in the stands. In Dallas, Mikael Granlund scored on a wrist shot from just inside the blue line with 8:19 left and Nashville, after blowing a two-goal lead, beat the Stars for a 2-1 lead in their Western Conference series.